unemployment rate : The Two-Way There were about 50,000 more jobs added to payrolls than economists expected. Also: September's growth was revised upward. This is the last major economic report before Election Day and is sure to be a hot topic on the campaign trail. How many signs like this were there in October? We got a clue today. The nation's unemployment rate edged up to 7.9 percent in October from 7.8 percent in September, the Bureau of Labor Statistics says. But private and public employers added 171,000 jobs to their payrolls — nearly 50,000 more than economists had expected. So the news is somewhat mixed: While the jobless rate remained stuck near 8 percent, job growth was better than forecast. -- Republican presidential nominee Mitt Romney's reaction. -- Why the jobless rate went up even as more jobs were added to payrolls. At 7.9 percent, the jobless rate is more than 2 points higher than President Obama said it would be by this time in his administration, Republican presidential nominee Mitt Romney just told supporters in Wisconsin. The difference equals 9 million fewer jobs than Obama had predicted, according to Romney. He has also echoed comments he made earlier about the economy not getting on track during Obama's time in office. At a campaign rally in Ohio, President Obama just pointed to some of the good news in the report, including the word that private employers added "more workers in October [184,000] than at any time in the last eight months." In February, private payrolls rose by 254,000 jobs. "We've made real progress, but we are here today because we know we have more work to do," Obama added. Earlier, Republican presidential nominee Mitt Romney said that "today's increase in the unemployment rate is a sad reminder that the economy is at a virtual standstill." "While more work remains to be done, today's employment report provides further evidence that the U.S. economy is continuing to heal from the wounds inflicted by the worst downturn since the Great Depression," Alan Krueger, chairman of the Council of Economic Advisers, says in a statement just released by the White House. "Over the last 12 months, the economy has added a total of 2.1 million jobs, as compared to 1.9 million over the preceding 12 months." "The household survey and establishment survey employment measures often show different month-to-month changes. The establishment survey employment series has a smaller margin of error than the household survey because of its much larger sample size. An over-the-month employment change of about 100,000 is statistically significant in the establishment survey, while the threshold for a statistically significant change in the household survey is about 400,000. However, the household survey has a more expansive scope than the establishment survey because it includes the self-employed, agricultural workers, and other workers who are excluded by the establishment survey. Over longer periods of time, the employment measures from the two surveys tend to track more closely." "Today's increase in the unemployment rate is a sad reminder that the economy is at a virtual standstill," Republican presidential nominee Mitt Romney says in a statement just released by his campaign. "The jobless rate is higher than it was when President Obama took office, and there are still 23 million Americans struggling for work." In the year before President Obama took office, the jobless rate rose from 5 percent in January 2008 to 7.8 percent in January 2009. The rate then continued upward, to a recent peak of 10 percent in October 2009. It didn't drop back below 8 percent until this September. Planet Money has charted the 22 million Americans who are "unemployed or can't find full-time work." -- 578,000 people reported they had joined the labor force, either by finding work or just by looking for a job. -- 410,000 people said they had found employment. -- So, the ranks of the unemployed grew by about 170,000. Reminder: BLS is really reporting on two surveys: One of households and one of employers. Two surveys mean two sets of results that sometimes seem to say different things. In this case, though, both surveys are showing job growth in October. Though public and private employers said they added 171,000 jobs to their payrolls, the BLS says its survey of households indicates that 410,000 more Americans report they were working in October. That follows an increase of 873,000 in that figure from August to September. As we explained last month, the agency's two surveys — one of employers and the other of households — can produce different results. "Four years of persistently high unemployment and long-term joblessness might be the best President Obama can do – but it's nowhere near what the American people can do if we get Washington out of their way," House Speaker John Boehner (R-Ohio) says in a statement just released by his office. Update at 8:45 a.m. ET. Why Did The Jobless Rate Go Up? When job growth is stronger than forecast but the unemployment rate still rises, economists look at whether more people joined the labor force — hopefully because many of them are optimistic about being able to find work. According to BLS, "the civilian labor force rose by 578,000 to 155.6 million in October, and the labor force participation rate edged up to 63.8 percent [from 63.6 percent]." Meanwhile, "there were 813,000 discouraged workers in October, a decline of 154,000 from a year earlier." Discouraged workers are those folks who aren't looking for work "because they believe no jobs are available for them." 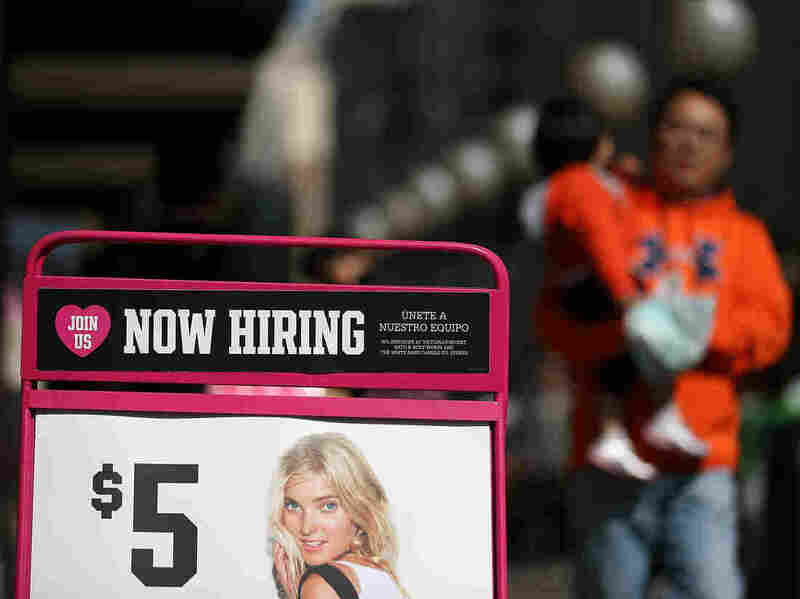 Those figures may signal that the jobless rate stayed near 8 percent in part because of good news — that more Americans are feeling better about the economy and have decided to start looking for work. That increased the size of the labor force, though, and helped lift the jobless rate a tenth of a point. There were 148,000 jobs added to payrolls in September, BLS now says. That's up from the agency's initial estimate of 114,000. The last major economic report before Election Day is due at 8:30 a.m. ET and economists say we should expect to hear that the unemployment rate ticked up to 7.9 percent in October from September's estimated 7.8 percent and that payrolls grew by just 125,000 jobs. -- Republican presidential nominee Mitt Romney says President Obama's economic policies haven't done enough to spur job growth and bring down unemployment. -- The president has been touting the slow job growth and gradual decline in unemployment since the jobless rate's recent peak of 10 percent in October 2009. He says they're signs the economy is on the right track. They're likely to hit those themes again today. Meanwhile, some skeptics — such as former General Electric CEO Jack Welch — will be watching closely to see if the BLS report fits with their view of how the economy is doing. We'll update this post with the news after the report is released, and follow with highlights and reactions. Also check Planet Money for economic analysis and It's All Politics for more on how the report might affect the campaign.